The company supplys high quality product and service for the bridge more than decades. We dedicated to our quality, in order to satisfy every customer with high-end products. TEST Post-tensioning Ltd. is certified with ISO 9001 in year 2012, and continuously improve to meet latest ISO 9001-2015 requirement. 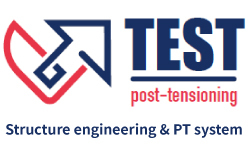 TEST Post-tensioning Ltd was established in 1998 in Taipei, Taiwan. We provide high-quality product and service for bridge industry more than decades, and recently expanded our scope to anti-seismic devices for bridge and building. We provide the best solution for ODM/OEM products. Certified by ISO 9001, high quality supplier of infrastructure ＆ building material. Providing best solution for OEM/ODM product.